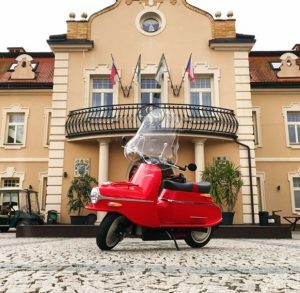 The story of Čezeta goes back to the time of 1957 when the first iconic torpedo-shaped scooter was manufactured by the Česká zbrojovka Strakonice. The motorcycles were exported all around the world until the production was shut down in 1964. Today, Čezeta – led by British entrepreneur Neil Eamonn Smith, continues as a start-up motorcycle manufacturer with its production based in the Czech town of Prostějov. In 2017 the company has launched a new Čezeta model – Type 506, which competes with the world’s most renowned motorcycle brands. Not only the classical design of its predecessor but also its exceptional parameters make the new Type 506 unique. Čezeta Type 506 is fully electric motorcycle and the Czech first electric vehicle. The motorcycle contains the same battery components as Tesla vehicles and all the electrical and communication systems were tailor-made by Čezeta and its mainly Czech and Slovak suppliers. Čezeta has recently completed a successful campaign at Crowdberry where 66 investors raised 600 000 EUR. The investment will be used to increase the production capacity to to satisfy the increasing demand for Type 506 all around the world. The investment was very successful in terms of speadand investors’ demand. Cezeta decided to raise additional 200 000 Eur, this campaign is currently still running.